The power to create a more meaningful life lies within you! It can be easy to get caught up in the day-to-day rush of life and forget what is really important. 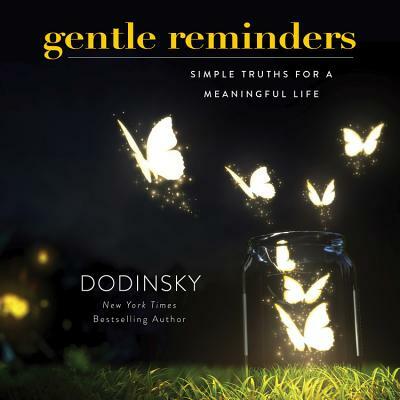 Filled with inspirations and motivational quotes from bestselling author Dodinsky, Gentle Reminders encourages you to be your best self. These pithy, memorable sayings combined with captivating, dream-like illustrations engage the imagination and uplift the spirit. This small gift book is perfect as a bedside companion or can be carried along with you to remind you to live life to the fullest wherever you go. Dodinsky is the author of the New York Times Bestseller, In the Garden of Thoughts, published by Source Books in 2013 with translation rights sold to Germany, South Korea, Argentina, Mexico, and China. His follow up book, In the Garden of Happiness, was released by Sourcebooks in 2015. Dodinsky's online fan base grew from 35,000 in 2010 to a collective total of just over 5 million by 2014. His intent was simply to share his reflections about life in order to help heal the wounds inflicted by life's troubles.